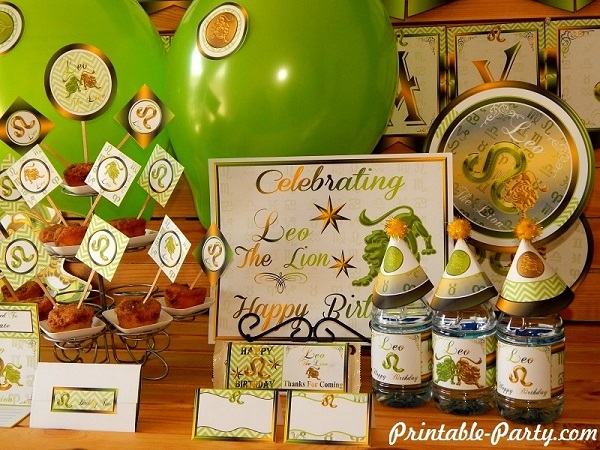 Leo zodiac printable party decorations, to create a classy horoscope themed celebration. 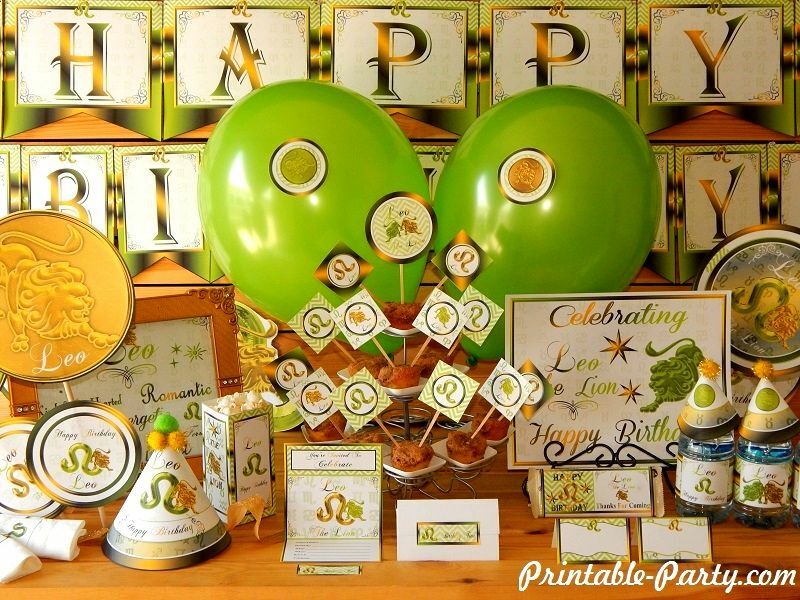 This party theme is blasted with classic colors of the green Leo astrology sign birthstone called the Peridot. This theme is also blended with black & shiny gold colors. 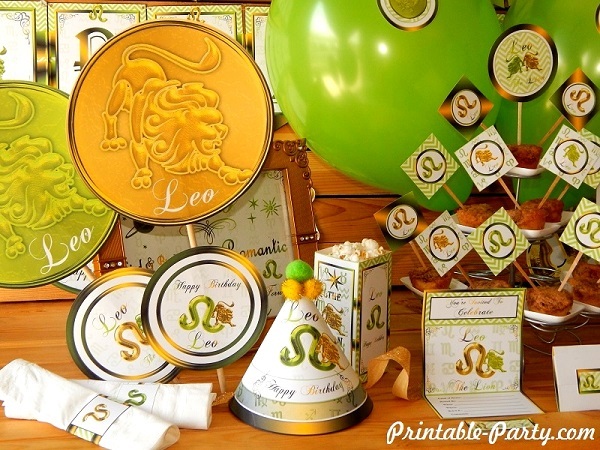 You'll find textured images of green & gold lions with zodiac sign symbols. 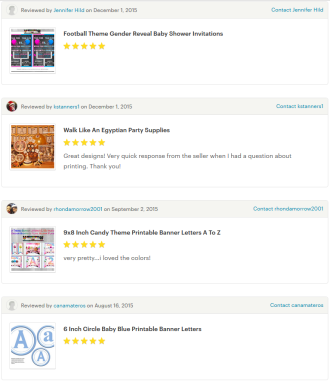 All purchases of PDF digital printable files will become available for you to download right after being redirected from the payment processing center. 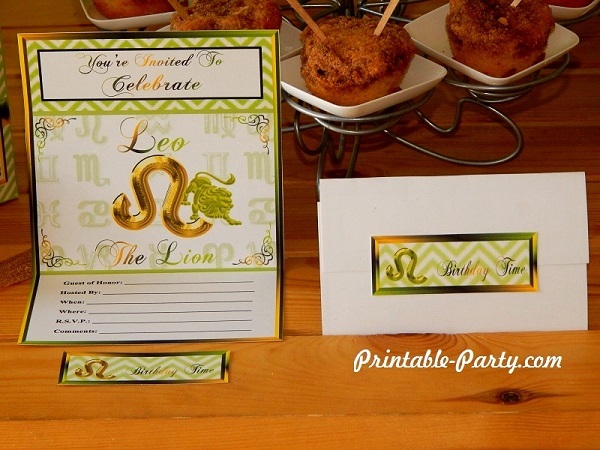 4.5x7 Inch trifold invitations. 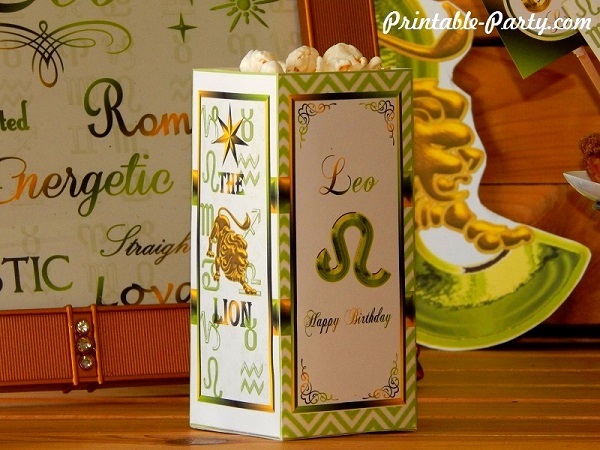 Can be left unfolded to fit in 5x7 envelope or folded to fit into A2 envelopes. Comes in 2 designs. 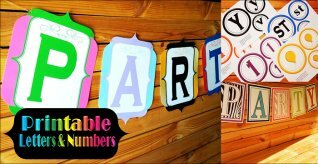 17 pages of banner decoration. 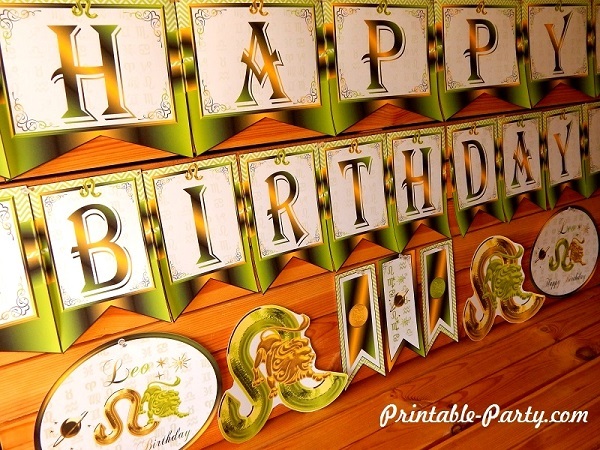 5 flags that spell happy & 8 flags that spell birthday. 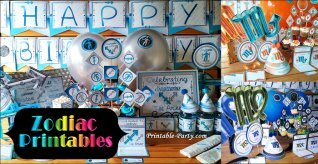 7 bunting banner decor, oval signs, & zodiac symbols. 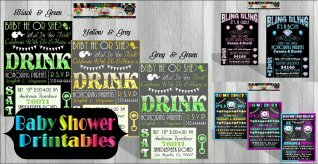 Drink bottle labels come in 3 designs & can be wrapped around any personal sized bottle or drink box. Easy to trim & seal flaps with tape. 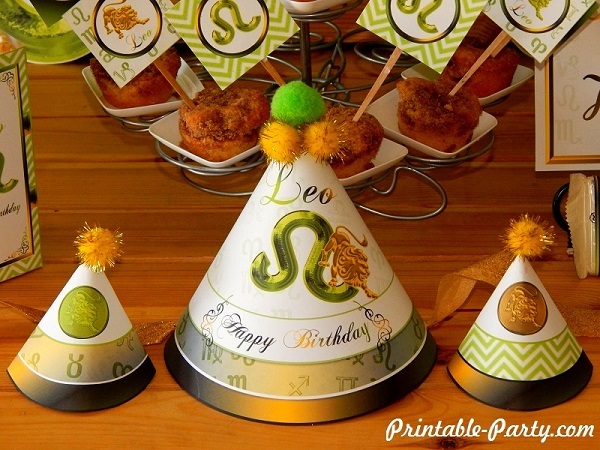 Standard cone party hat & mini hats. 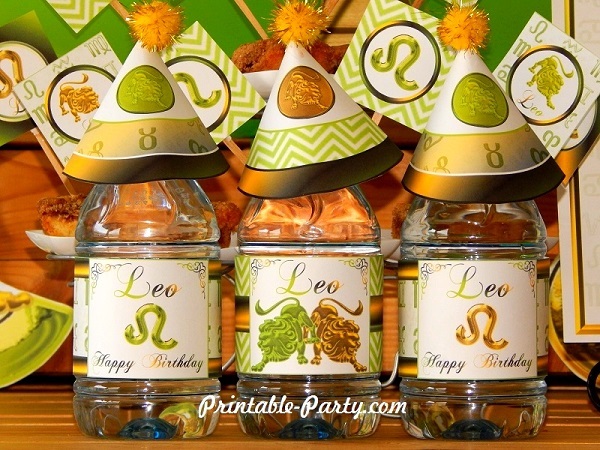 Mini hats can be used as bottle toppers or for decor on party tables. Add pom poms for style. 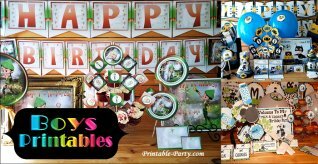 Printable open top snack box is great for dry snacks for small partying gifts. 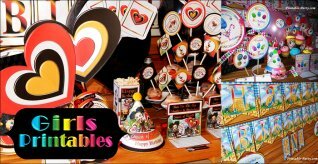 Can also be placed into a cello bag to use as a favor when filled. 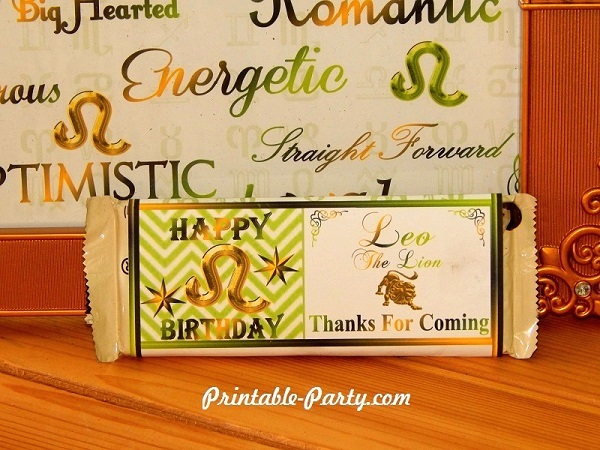 Printable candy bar wrapper fits snug around any Hershey brand chocolate candy bar, cookies & cream bar, & Mr. Good bar. Seal with tape or glue.